Our group lesson timetable enables you to progress through our structured 7 level skill system with other participants aged 8+ of the same ability. There is a maximum of 12 participants on each group lesson. Our group lesson timetable enables you to progress through our structured 7 level skill system with other participants aged 8+ of the same ability. There is a maximum of 12 participants on each group lesson. As everyone progresses at a different pace, we can never guarantee the completion of a skill level in one lesson. You must have completed level 4 to be eligible for open practice sessions on our 160m main slope. Call us on 01752 600220 to book your reservation. Click here to view our Winter timetable. Our group lesson timetable for Tots up to 7 years old, enables your child to progress through our structured skill level system with other participants of the same ability. There is a maximum of 6 pupils on lessons up to level 4 and a maximum of 8 pupils on level 5 lessons. Each level is a 1 hour lesson. Private lessons are a good form of learning for those that wish to progress quickly or just want a re-assessment of their ability. Friends & family can also take part with you; we just ask that the participants are at the same skill level. Shorter 30 minutes sessions are available for Tots skiers (up to 7 years). To book, call 01752 600220. Please note: All lessons must be pre-booked and we recommend that participants are of similar level of ability. Please note, times may vary from website due to scheduling. 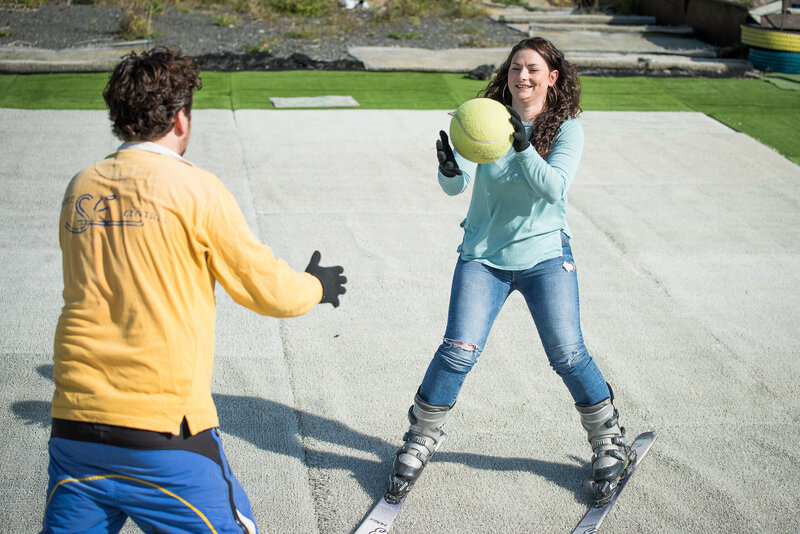 Become familiar with the ski equipment: Learn how to walk and slide on a flat surface. Progression to walking and sliding down a slope: Able to side step up our teaching slope and slide back down. Awareness of the Ski code: Learn the basics behind the ski code. Snowplough glide: Be able to glide down the slope slowly using a Snowplough to control their speed. Snowplough brake: Be able to stop halfway down the slope using the Snowplough. Straight run to snowplough stop: Be able to do straight skis down the hill and bring themselves to a stop using a Snowplough. Snowplough turning exercises: Be able to do small direction changes on the way down the slope staying in the Snowplough. Snowplough turn in and out of the fall line: Be able to do controlled turns in both directions maintain control using a Snowplough. Use of lift: Be able to use drag lift unaided. Linked snowplough turns: Be able to do linked S-shaped turns down the slope using the turn and Snowplough to control speed. Linked plough turns – varied radius & control of speed: Be able to control plough turns and change them based on the terrain steepness, whilst maintaining their speed. Basic plough parallel: Ploughing around the corner and matching skis after the fall-line. Plough parallel: Progressively matching skis earlier in the fall-line. Basic parallel turn: Be able to perform controlled S-shaped turns down the slope with lots of skid keeping the skis parallel throughout the turn. Parallel turns – long radius: Be able to do wide controlled parallel turns using the entire slope, whilst still maintaining control of speed. Parallel turns – short radius: Be able to perform parallel turns down a narrow run whilst still maintaining control. Carving: Be able to hold a carving motion down the slope by using the edge of the skis. Private lessons run all week. Give us a call on 01752 600 220 to discuss times. 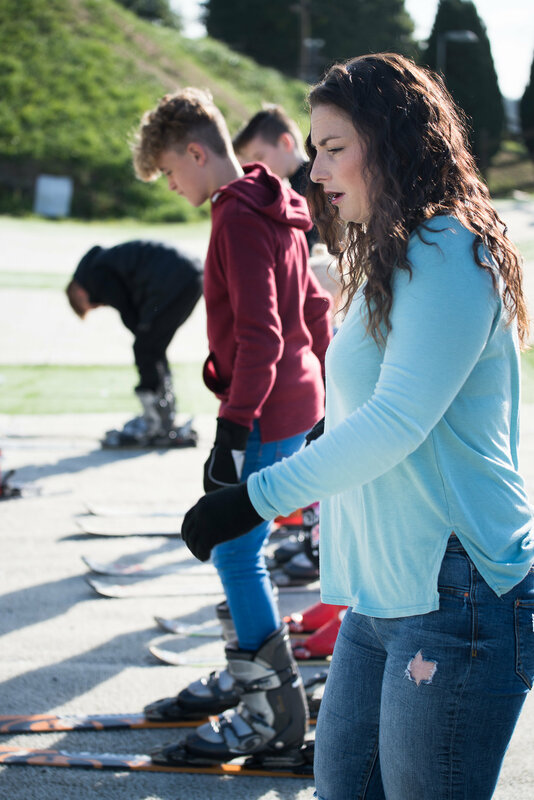 A: To take part in a ski or snowboard lesson you must have long sleeves, long trousers and gloves. If it is hot weather then leggings/tracksuit bottoms and long-sleeved t-shirts are perfectly fine to wear. Q: Can I bring my own equipment? A: You can indeed. However due to the nature of dry slope skiing and snowboarding wear and tear is increased so we recommend that you save your kit for the mountains and use ours on the mats. Q: Do I need to wear a helmet? A: Helmets are optional at the slope, however, if you are taking part in freestyle or race clubs then a helmet is a must. Q: How early should I arrive for my lesson? A: If you could be on site at least 10 minutes before the session start time, that will allow you enough time to get suited and booted. Q: What is the minimum age for skiing/snowboarding? A: We can take children as young as 4 years and up for skiing and children from 8 years and up for snowboarding. Q: What surface do you have? 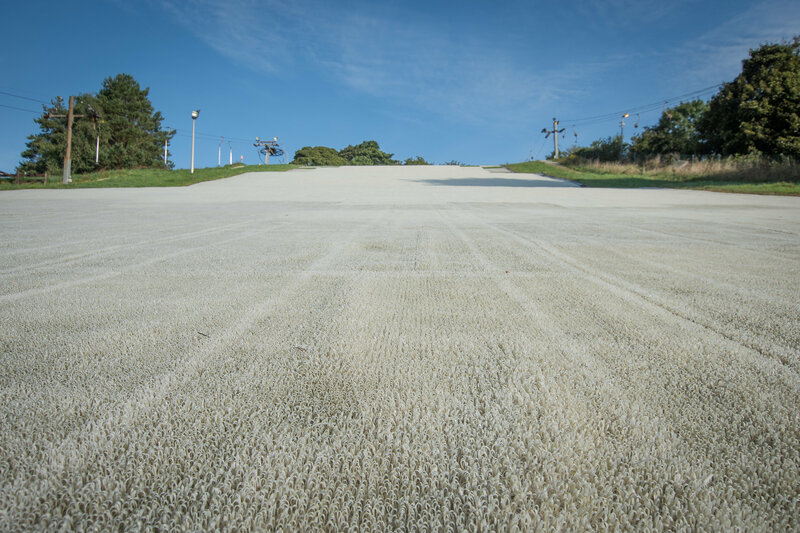 A: We use PERMA-SNOW on our two slopes. It is quite different to the diamond matting that dry slope skiing is known for, as it does not have any holes in the mats. This makes it a very user friendly surface to ski and snowboard on. Q: I can ski already, however, I have never been on a dry slope. What are the major differences? A: Despite what level of skier you maybe on the snow, on dry slope you will start a level lower. On snow you can get away with minor flaws in your technique, where as on the dry slope you cannot. Snow surface is a lot faster and easier. The snow building up under your skis or board along with the reduced friction can help you make the turn or the stop, whereas on dry slopes you have to turn the ski and edge the board using technique which may take some time to get used to, if you have only ever skied on snow.